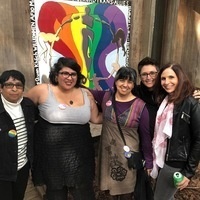 We welcome all LGBTQIA+ Banana Slugs, their loved ones, and families to (re)connect with current students and staff at the Cantú and to mix and mingle with fellow alumni. Come learn about what's new and exciting for current students and reminisce about the not-so-distant queer years at UC Santa Cruz! This year, we'll be inviting those in attendance to share stories about their time at the Cantú space, with a special focus on stories and memories from and about Lionel Cantú Jr., the center's namesake, for those who were around when Lionel was providing support on campus to LGBTQIA+ students. We will have delicious food and drinks, and plenty of photo albums from over the years. Don't miss out! If you can't make it in person, feel free to email your memories of your time at Cantú space and/or with Lionel Cantú Jr. to queer@ucsc.edu. We look forward to being in community with all of you!